Matted and ready to pop into a standard frame: This interesting color 8" x 10" poster print (image fits approx. 6" x 9" because of its the poster's orig. 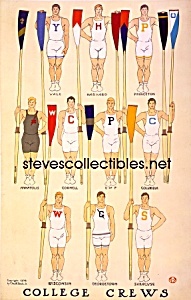 size) is from an original color poster known to be c.1908 American Illustration Art by Edward Penfield - Ten men representing members of rowing crews, from Yale, Harvard, Princeton, Annapolis, Cornell, University of Pennsylvania, Columbia, Wisconsin, Georgetown, and Syracuse, holding oars.